Wandering Shadow: Hope on the riverside..
For days I wanted to share with my friends, a few photographic collections from my visit to a ghat (river side), near Nigambodh Ghat in Delhi. It was the 10th day Kriya (ceremony) of my distant relative; who passed away almost a month back. It was a cold morning. 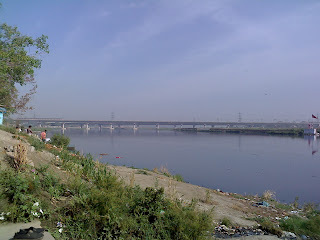 The Yamuna looked pathetic with clutter of rubbish on its bank. Though I loved its beauty, its vastness and the surrounding green belt. The metro far above on a platform of the river looked a miracle, flying away in jet speed. It took my gaze to and fro between the two sides of the river every few minutes. 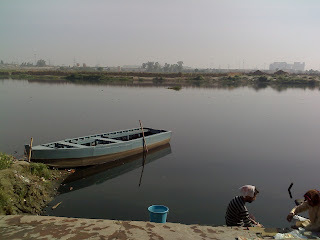 A blue colored boat lay lazily still on the riverside. So did I. On the steps I sat, staring away at the far length of the river. The boatman lived just on the entrance of the lane near the steps. The blue door of his house attracted my attention. I was told it was decades old. Two decades old it was. ...The blue door of his house attracted my attention. I was told it was decades old. Two decades old it was. I still see some hope for future Hope of returning to my land, my home. 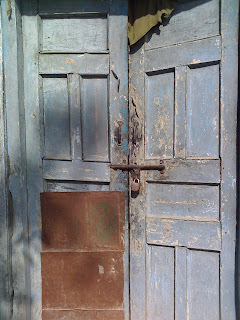 The door of my home in Kashmir would be old enough now. I hope it will attract my attention. The home that I want to return. My home which was burnt to ashes in 1995. The past nostalgia is still churning itself inside me; the hope for future is burning all around me. Dude, its your birthday, Stop comparing yourself to a door! As Pooja rightly said..Next time ur Bday wld be celebrated in Kashmir...not in Nehru Place park...but in Nehru Park..in the mid of Dal Lake. As that boat lies in wait for someone to sail it across and make it reach that far end, so is a whole community,culture,crushed dreams and yearning eyes.....waiting for a day when home will not be a shelter!! A compulsive activist and a future politician. i actually think it is one of your best pieces - for me atleast. i love symbolism and you have made full use of that. the irony and the connections you have made are great....'instantly amazing' is how i describe it. it struck the cord immediately. Many more decades will come and they all will be on the bank on vitasta. For any creative person any kind of commotion in thought process particularly a melancholic,gloomy state of disturbance renders one helpless;so cannot focus on one's creative ability.It is not applicable to writer only.All men of art do encounter such impediments.The surrounding around them fail to find compatiability with their mental horizon. The Yamuna river looked pathetic with cluttered of rubbish.But u have not exihibited any such snaps which could spot the places and heaps in the flowing water.Those a few snap would have added some colour to the cause u want to highlight. The piece shows sorrow in some corner of the heart of the writer.It depicts Mathew Arnold's Dover Beach poem in which he hears sounds of sorrows,destruction of Humanity in battles, along with the rythemic sea waves which crawl over sandy beach under moonlight at Dover Beach.